Virgin America recorded one of its best financial performances in its history during 2Q2014 as profits trebled year-on-year to USD37 million. After a 1Q2014 loss of USD22 million Virgin America still managed to eke out a USD15 million profit during 1H2014. The airline has also officially submitted the necessary information to US regulators for an initial public offering, something Virgin America has frequently discussed during the past year. Its prospects of successfully executing an IPO remain challenging. Virgin America’s financial track record and, albeit improving, its balance sheet remains only limitedly attractive to potential new investors. Despite progress in its financial performance, Virgin America’s challenges for now continue to outweigh its strengths, a scenario it needs to turn around for the long term. Its current investors may be pressing for an IPO, but accessing the public market does not guarantee long term staying power. In this Virgin may be helped by the current "restraint" of the newly consolidated majors, providing greater stability not only for themselves, but also for other quality incumbents. On 12-Aug-2014, Virgin America reported its financial results for for 2Q2014, its seventh straight quarterly improvement, with an operating margin of 11.8%, on operating income of USD47.1 million and net income of USD37.0 million. The improved result reflected a 7.8% improvement in RASM year on year. Anticipating its profit, Virgin America had filed an S-1 form with the Securities and Exchange Commission, prefacing an Initial Public Offering. CAPA takes this opportunity to offer a SWOT Analysis of the airline. This is in no way a financial analysis of the airline for the purposes of investment and should be read purely as an industry overview. The SWOT is in two parts; this first part addresses only Virgin America's Strengths. It should be read in conjunction with Part 2, which will be published on 20-Aug-2014. Since its first flight in 2007 Virgin America has steadily built up a loyal following among tech-savvy travellers looking for a more upscale experience at a lower price point – the foundation of a hybrid strategy adopted by other airlines. Virgin America in Jul-2014 took “Top Domestic Airline” honours from Travel and Leisure for the seventh consecutive year, and was named Best Low Cost Airline in the USA for the fifth consecutive year by Skytrax. With its low price point, Virgin seems likely to continue to be regarded as the best premium product on the routes it flies, with a consistently positive in-cabin performance. It contrasts with the constant negative publicity that circles Spirit Airlines as some passengers interpret the airline’s extreme unbundling unfavourably. Spirit recently launched a campaign to improve passenger understanding of its business strategy; Virgin America's brand has no such need, at least with the travelling public. Los Angeles and San Francisco have been Virgin America’s two largest bases since it launched service from those airports to New York JFK in 2007. During CY2013, passengers travelling to and from Los Angeles International and San Francisco represented 45% and 53% of Virgin America’s total passengers, which reached approximately 6.3 million. Virgin America has only cut some three markets throughout its history – Orange County, San Jose and Montreal. Even as a relatively small airline within the US market place, Virgin America has caused some market disruption when it entered United’s fortress hub at Newark in Apr-2013 with flights to Los Angeles and San Francisco, breaking United’s monopoly on those routes. During mid-2014 United warned that Virgin America’s entry into those markets, and the subsequent 20% undercutting of fares, had pressured its unit revenues. 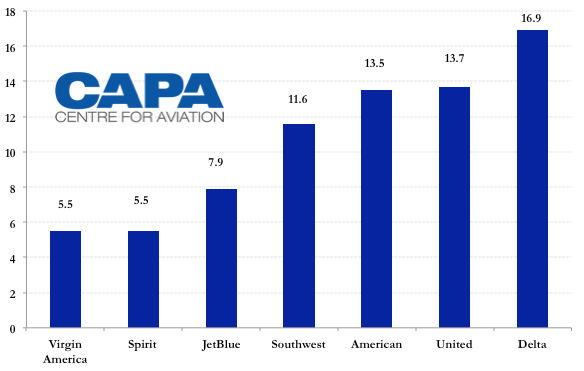 With an average fleet age of 5.5 years (as at 19-Aug-2014) for its all-leased, all-A320 family, according to CAPA's Fleet Database, Virgin has the most modern aircraft in the US industry, along with Spirit. The simple one-aircraft type concept delivers cost savings across a whole range of activities, from training and maintenance costs to fuel consumption – with somewhere around 15% lower fuel costs per ASM than Delta's 17-year old average fleet. Coupled with a relatively long average stage length, the single type allows for high utilisation, of around 11 hours, in turn supporting a lower cost base. On a stage length adjusted basis, Virgin America reports a CASM of USD10.98 cents, "23.6% lower than the average mainline CASM of the legacy airlines". For an airline competing for the business and frequent flyer market, supporting a wider network should generate incremental benefits in both usage and revenue profile. 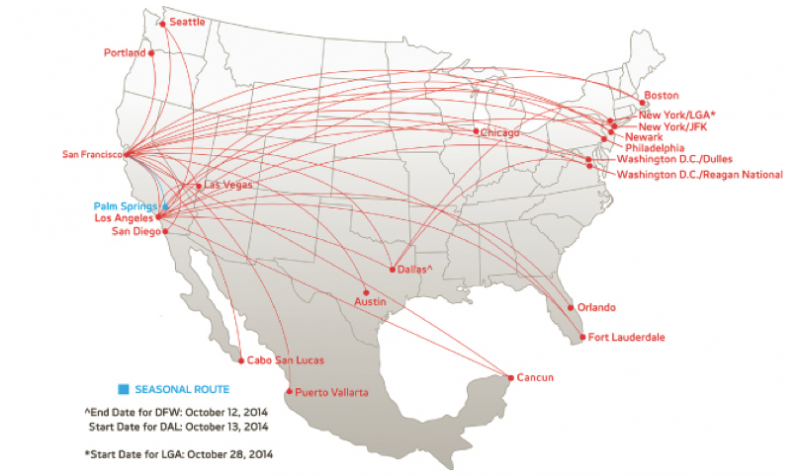 Virgin America says its new routes entered in 2011 and 2012 delivered RASM improvements of 20.5%, compared to 9.3% increases in pre-existing routes. Plans to "leverage" recent expansion are expected to "drive higher RASM" too. Some of these routes are highly contested and stiff fare competition is likely, but in today's more restrained environment, this is unlikely to reach levels seen in the past.